Are you a person that needs your espresso no matter what no matter where you are? Well, I think we have an espresso machine that might be right for you. The Uniterra Nomad Espresso Machine was designed to be clean and green and give you excellent quality espresso coffee anywhere, and it’s the subject of my review today. The manufacturers set out to create a machine that is truly a nomad whereby you can make high-quality espresso coffee anywhere. All you need is hot water and coffee. You don’t need any power source, batteries or high-pressure cartridges of any kind leaving a small eco footprint. 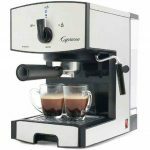 The designers wanted a simple but stunning designed espresso maker, that was easy to operate and help novice users easily make a great espresso. Nomad works and looks like nothing before it. Removing all electronics and adding a manual pressure pump for instant control simplifies the process. 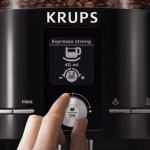 It is a completely new design concept that defines a whole new coffee making experience. They started a Kickstarter campaign a few years back and successfully launched the Nomad. The machine itself is a very artistic design that comes in three different colors: Luminescent green, Cobalt blue, or silk white and would fit nicely into any décor. Taking away the water boiling function made the nomad much simpler, lighter and easier to maintain and use. 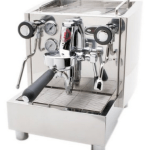 The basic unit has a built in water tank, a seesaw motion Nomad coffee pump lever to manually build pressure, coffee drawer, brew box, and basket. A good quality tamper is also provided to evenly press down your coffee. The Proprietary True Crema valve makes the Nomad able to use any coffee grounds that are not evenly ground, fine enough or improperly tamped. Making it pretty easy for anyone to make a great espresso coffee anywhere. The manufacturers recommend an espresso blend from your local grocery store will get you great results. But grinding coffee beans fresh is always the best option. To keep things totally off the grid, a Porlex Mini Hand Grinder is a great choice grinder for espresso coffee. Since there is no electricity needed all you need is boiling water and coffee. 2. Fill coffee drawer with even finely ground coffee. Tamp down coffee with tamper provided, be sure to tamp down evenly for best results. Make sure the top edge of the coffee container is clean to ensure a complete seal. This will help avoid leakage when pressurized water goes through the coffee and not out of the sides. 3. Insert coffee drawer into the machine and clamp down top lever. 4. Fill Machine with hot water. 5. Pump silver pumping mechanism on the top and watch the pressure gauge above the coffee container. Let the pressure rise into the green bars and keep the pressure at about 9 bars. Coffee will start appearing with a real nice crema on top. 6. Stop pumping a little before you reach the desired level. Keep a second cup handy to switch out to help avoid a mess. After you used the machine a few times you will get a better feel for when to stop pumping. 7. Add sugar if desired and enjoy your espresso anywhere. The Nomad Espresso Machine is a real eye catcher available in a variety of colors to fit any décor including a picnic table at a campsite. It is made of plastic and aluminum. The build quality is done right. It is light yet has a substance to it when it sits on the counter. Brush aluminum is used for the seesaw pump and the clamp down handle on the top. The tamper has a good weight to it and a quality feel for easy tamping of coffee. Lining up the edges of the tamper and metal coffee container helps ensure an even tamping. Everything can be taken apart for easy cleaning. But a little bit of running water really helps. So I suggest if you are taking your Nomad outdoors remember to bring some extra water for cleanup. Purchasing a second filter assembly can also help if you are doing a number of espressos. The patented True Crema Valve can be removed. But you must be sure to have even grounds and tamp your coffee evenly. Leaving the True Crema Valve on makes it pretty fools proof if you have uneven coffee grounds or if you improperly tamp the coffee. So why you would want to take it off I’m not sure. If you’re a cappuccino fan and need steamed milk than you would be out of luck with the Nomad. There is no hot steam option as there is no water boiling function on this unit. 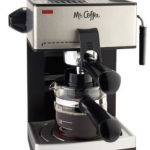 Although this machine makes an excellent espresso and is built very well the area where you place a cup is a little low, a little more headroom would be nice. You really need a small cup to get under the output valve and you will need an extra drip cup if you don’t want a mess. For a non-electric espresso machine for around $300 may sound a little expensive. 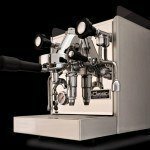 But if you compare the espresso quality to machines cost 2 and 3 times the cost this machine can go head to head and with the added portability and a low carbon foot prints that most other machines cannot touch, makes the Nomad Espresso Machine a real winner. Looks great Dave. Thanks for the opportunity to make a guest-post. Looking forward to doing more work with you.